Senator Nancy Binay led several incumbent lawmakers who filed their certificates of candidacy for the May 2019 elections on Friday, even as the Commission on Elections vowed to screen all possible nuisance candidates a week after the filing of CoCs ends on Tuesday, Oct. 17. 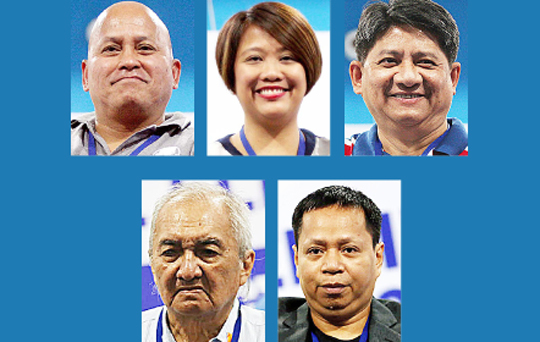 Binay joined former police and prisons chief Ronald “Bato” dela Rosa, lawyer Larry Gadon, and little-known bets Ricky Bacolod and Nid Anima as Senate hopefuls in the midterm elections. One prominent rumored Senate candidate, Davao City Mayor Sara Duterte, isn’t running—according to her father, President Rodrigo Duterte, on Friday. “She won’t run as a senator, she won’t as a president. Believe in me. She’s too wise for that,” he said in a press briefing in Davao City upon his arrival from Bali, Indonesia. The President’s son, former Davao vice mayor Paolo Duterte, is instead running for congressman of Davao province’s first district. He filed his CoC together with Sara Duterte and brother-in-law Manases Carpio, the mayor’s husband. Another prominent bidder for a House seat is Juan Miguel “Mikey” Arroyo, son of House Speaker Gloria Macapagal Arroyo, who is stepping down after three terms to take a break from politics “as agreed upon by their family and the party,” he said. Mikey filed his CoC as a candidate of Lakas-CMD. One legislator setting his sights on local politics is Senator Francis Escudero, who is running for governor of his home province of Sorsogon. Former movie stars filing their election papers on Friday were Social Welfare Undersecretary Isko Moreno, who will run for mayor of Manila; and Rep. Vilma Santos, the former Batangas governor who is seeking a second term as Lipa City’s representative. Meanwhile, on the second day of the filing of CoCs, the Comelec received more than 60 applications —more than half of them that could be considered as a nuisance, including a janitor. The poll body expects more than 200 senatorial bets to file their CoCs until the last day of filing on Tuesday. In the last local elections, the Comelec received a total of 310 CoCs for senator, but only 60 were qualified to run. Comelec Commissioner Sheriff Abas said the body will also resolve disputes within political parties in the coming weeks, following the filing of folk singer Freddie Aguilar for senator under the breakaway faction of the Partido Demokratiko Pilipino-Lakas ng Bayan. “The Comelec has yet to identify which wing of President Duterte’s PDP-Laban party should be deemed as the legitimate group,” Abas said. Printing of election ballots for the May 2019 elections will start on January next year after the Comelec finalizes the list of qualified candidates, including substitutes, he added. The filing of CoCs for the 2019 polls will not be extended beyond Oct. 17, Abbas said Friday. JV has been using Ejercito—instead of the name of his father, Manila Mayor and former president Joseph Estrada—since entering in politics. Former senator Jinggoy Estrada, who has his father’s blessing for a Senate bid unlike JV, will continue to use his surname. The poll body will hold an executive session on Oct. 18 to discuss election rules, including who are legitimate political parties, nuisance candidates, qualified party-list nominees, among others. Candidates who belong to groups deemed as “breakaway” would become independent candidates, said Comelec Law Department Director Maria Norina Tangaro-Casingal. “A political party is only entitled to nominate only the number of positions to be voted for,” Casingal said. Only 12 candidates will be allowed to run under a political party, she added. “If a political party fielded 12 and another 12 for the same party but with different wing, the second party with 12 candidates may be considered independent candidates,” Casingal said. “We have to determine who are the real members,” she said.